Note from me: This isn't a common occurrence, but in addition to this blog, I'm putting the post below on my hockey blog at http://ahockeyguy.blogspot.com/. The reason for the dual-location post is simple... I'm writing about a book that I just finished... and it's about... hockey! 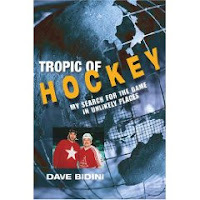 "Tropic of Hockey" is from Canadian musician/author guy Dave Bidini (his website here) and it's a chronicle of his experiences with the game in such hockey hotspots (maybe literally, but not figuratively) as Dubai, remote (and not so remote) China and Transylvania. As I touched on in my hockey blog post about the U.S. Pond Hockey Championships, the impetus for Bidini to write "Tropic of Hockey" was a growing sense of disillusionment he felt with the NHL version of the game and a desire to reconnect with it by playing and seeing it from different parts of the globe. While I do love the NHL, I could understand his romantic notions of the game and this desire to experience it in a new way. Not entirely the same, but it makes me think of my appreciation for the "Original Six" teams of the NHL and the fans in hockey markets that care deeply about their local team (see: hockey blog post about Montreal). Chapter 4 - "Wendel and the Bells": Bidini's story about how he became a hockey fan again as an adult. A very cool description of how it came about and how one player (the aforementioned Wendel Clark of the Leafs) became his favorite. Chapter 9 - "Bobby Clarke's Teeth": Mention of Bidini communicating with people in China entirely through the language of Russian hockey players they all know of. I like how the words "Fetisov", "Tretiak" and "Kasatonov" can tie people together. Chapter 14 - "Journey to the Temple of the Dog": Includes anecdotes about Bidini and his friend masquerading as members of the press to secure interviews with favorite players and entry to parts of one of my most vividly remembered hockey events... Rendez-vous '87 in Quebec City between the Soviet National Team and NHL All-Stars. Chapter 17 - "A Busload of Espo": Primarily about Phil Esposito the '72 Summit Series between Canada and the Soviet Union. The description of the eight-game set makes me wish I had been a fan then (difficult since I wasn't born until a year later). Chapter 23 - "The Last Canadian Game": Interesting to me for two reasons... one is how much I appreciated the description of Bidini's attendance at the final game in Maple Leaf Gardens (which I wish I had been able to watch Toronto play in). The second (and very different) reason is Bidini's mention of "The Whiskey Robber" during this section of the book on Transylvania. As I was reading this portion, much sounded familiar to me and it was because of my reading of "Ballad of the Whiskey Robber" by Julian Rubinstein. I had completely forgotten this it was a true (or at least mostly true) story about a Robin Hood-esque Hungarian hockey player. So cool... I love when stuff comes together. So, all this said about the Bidini book... I liked it a lot and think that most hockey fans would as well... particularly those of us that love the history of the game and it's impact. I know this borders on the ridiculous, but I say... finally, the article "Why We Shouldn't End Our Manned Space Program" from the Feb 2009 issue (cover image below) of Esquire Magazine is online so I can write about it (and of course link to it). It may seem a bit obsessive for me to have been continually checking the Esquire website, but me thinks the writing that good. Done by my favorite living writer (I know it sounds kind of odd to say that, but it's not fair to compare everyone to Ayn Rand), Chris Jones, it achieves that dual goal that I think so hard to find in writing... something about an interesting topic that's written really well. I've linked to and written about writing from Jones several times, touching on various pieces from Esquire and about his book "Out of Orbit (or "Too Far From Home") and gotta say... I really like his writing. His stuff is insightful, poignant and colorfully written about topics of either interest or great import. It doesn't relate at all to why I like the writing, but I'm very interested to know if as a Canadian, he's written about hockey. Hmmm... I might gotta try to find that out. Labels: Chris Jones, Esquire, space, Why We Shouldn't End Our Manned Space Program"
Just finished reading "Outliers" by Malcolm Gladwell and I'd say that it's place high up the New York Times Bestseller List is richly deserved. Gladwell is also the author of two prior best sellers... "Blink" and "The Tipping Point". Details of each of these (well, all three books) can be found on the author's website, but personally, I enjoyed "Outliers" the most. The subtitle is "The Story of Success" and throughout the book Gladwell paints an interesting portrait of what causes some to achieve greatness, and others... not so much. He certainly doesn't give short shrift to the idea of talent leading to achievement, but provides example after example of how the right external circumstances are needed to lead people to the top of their professions. In looking at this idea of the "stars being aligned", it's important to not overlook the prerequisite of hard work that Gladwell writes of. During the course of the book he details underclass New York City students achieving success academically... largely as a result of a school schedule that both takes more of the day and runs longer through the year than that of most students. Additionally, he lays out what he terms as the "10,000 hour rule" as a guide for what it takes to achieve mastery of a subject. With examples ranging from Bill Gates of Microsoft, Bill Joy of Sun Microsystems and The Beatles, he shows how these high achievers had early periods of their "professional lives" where they put in this amount of work to become truly proficient. This all said, the external circumstance notion is where Gladwell details what he sees as a needed component of success that is often overlooked... the right time and place. For the inner-city student, they have to win a school lottery to attend this "KIPP School" in New York and for Bill Gates and Bill Joy, they were born at a particular time ideal for them to be a part of the personal computers revolution. More specifically, Gates and Joy both had the good fortune of being (through no real plan of their own) in a position to be able to put the time in (harken back to the 10,000 hour rule) to achieve mastery early on. This doesn't mean that they weren't both extremely smart, but does mean that the circumstances of their lives enabled them to be able to put the effort into their subject area and then capitalize on this mastery gained. Another example from Gladwell around this idea of both fortunate external circumstances and development time spent comes from the world of youth hockey in Canada. It's a fair statement to say that the best adult players were likely some of the best players growing up and got the best coaching and most opportunities for meaningful practice. From this, the question becomes how they got identified as having potential... especially in a system where players by the age of 10 are grouped into "competitive" teams (which is where the elite usually come from) and "recreational" teams. To get at the answer, you have to know that at a young age, the best players are usually... the biggest. At this same young age, the biggest players are often... the oldest. So, what you see when looking at the rosters of NHL players or the top junior leagues that feed the NHL is a preponderance of players born just after the Jan 1 birthday cut-off for classification into age groups. These players born at the beginning of the calendar year are then competing against players up to a year younger (when you match up someone born Jan 2 vs Dec 30 as an example). The difference isn't going to matter in the prime of their careers, but matters quite a bit at 10 years old when someone is determining who has more potential... and will get more ice time, access to better coaching and the opportunity to put in more work and get rewarded accordingly. A different section of the book revolves around how background contributes to success. Getting at this, Gladwell looks at commercial airline pilots and how their ethnic background (external circumstances in the vernacular of this book) contributes to their success or failure as a pilot (measured here in the most important scoring parlance... accident rates). For someone to fly passenger jumbo jets, they're almost certainly going to be smart and highly skilled at flying, but the external circumstance of their culture can have an impact on how likely they are to be involved in crashes. The reason that Gladwell points to has to do with a culture's willingness to question authority. In multiple examples from the this section, he points out how people from certain cultures are going to be less likely to question their "superiors", even if they know that their superiors are wrong. This can manifest itself as deadly in a cockpit if you have a pilot who for whatever reason is making a mistake, but the "subordinates" (co-pilot and first officer in this airline example) are hesitant to directly point out or call the pilot on the error they see. Through either not saying anything or making gentle suggestions when forceful language is required, the people around the pilot could have prevented a crash from occurring... had they been willing to takes the steps needed to prevent it. While not carrying as much import as the life or death involved in plane crashes, Gladwell also included a chapter with similar meaning around how class rather than ethnic circumstances can impact the success of two equally smart people (has to do with the interpersonal skills and willingness to question authority of those raised in the upper or middle as opposed to lower class). These are just a few of the concepts from the book that struck me as most interesting. Whether it be about smart kids, pilots, hockey players inner-city students or computer guys, though, all the examples from the book touch on this idea of great success not coming out of the blue. Rather, a combination of talent, hard work, social circumstance and good fortune making it happen. Very interesting read and I highly recommend. Great cover story by Joe Klein in the Feb 2 issue of Time Magazine. "What the cynics fail to understand is that that the ground has shifted beneath them- the stale political arguments that have consumed us for so long no longer apply." Whether Democrat or Republican, some may feel this an impossible aspiration, but... as Pittsburgh Steeler head coach Mike Tomlin said of Obama, "he's selling hope, and I'm buying." Also from this issue of Time was the story "Books Unbound" about the publishing industry. As the book business has gone through great upheaval of late, one of the consequences has been the emergence of unknown authors self-publishing on the cheap... and in many cases becoming not-so-unknown. To this idea of books not going through traditional routes to market, the article reveals that 4 of the top 5 best-sellers for 2007 in Japan were written on cell phones. Granted, the adoption of consumer technology in Asia is ahead of that in the U.S., but the statistic is amazing bordering on ridiculous. Fortune Magazine recently came out with it's annual "100 Best Companies to Work For" list and there's quite a few interesting views of the information. The list itself can be found here (with the ability to select each company for a snapshot view) and a look at each of the 20 companies with over 350 job openings is here. There's also an interesting look at the online shoestore Zappos (#23 on the list) as well as info on the new #1 best company to work for... NetApp in Sunnyvale, CA. 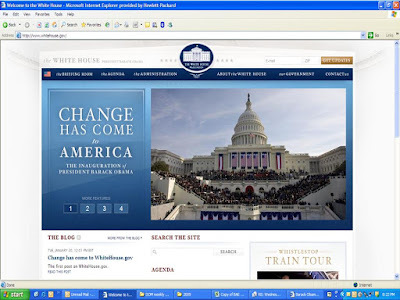 From http://www.time.com/ comes Nancy Gibbs' piece "Barack Obama's Inaugural Address: Humility, Gratitude, Sacrifice". Excellent writing befitting the occasion. 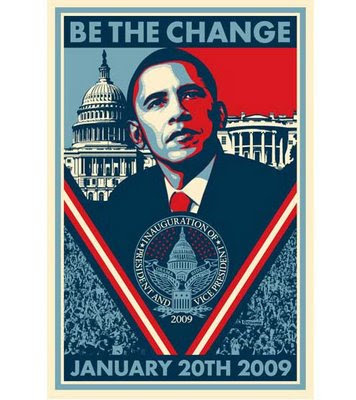 The official Presidential Inauguration poster... designed by artist Shepard Fairey. On a related note, there's a very interesting piece in the Jan 26 issue of Time Magazine titled "Obama's Permanent Grass-Roots Campaign" around the general population who got involved with the Obama Presidential Campaign. From the 20,000 people trained in community organizing to 3 million people who donated money and 13 million who supplied their e-mail contact info, this is a large group of people with the ability to continue aiding the cause of what will now be the Obama Administration. Several interesting things from the Jan 19 issue of BusinessWeek. Probably most noteworthy was a book excerpt from Consultant Ram Charan in the Jan 19 issue of BusinessWeek. Titled "Leadership in the Era of Economic Uncertainty", the book purports to give detailed steps on how corporations can make it through the current financial conditions. The excerpt itself provides an example of how a major company (which also happens to be a Charan client) reacted to the first signs of an economic crisis and what steps they've taken with their business. It's of course difficult to fully evaluate Charan's book on just an excerpt... and I question a little bit the accolades heaped on a CEO who retains the author as a consultant... but, I did find interesting the employee communication that appeared to take place at Dupoint. Given that the main thrust of the actions were around reducing costs, this certainly must have both impacted employees used to the existing environment in the company, and concerned them with questions around their job security. Probably not a lot different than actions that have had to take place at other companies lately, but where Charan appears to say Dupont has done it better is in the speed and execution/communication. From an individual employee perspective, people are going to be a lot more behind the actions of their company if they've had the reasons completely explained and share some ownership in the decisions themselves. The specific example that Charan provides is that within 10 days of official corporate action around cost control, each employee had both met face to face with a manager to discuss what was needed and also specifically asked what they could do to help. As Charan writes, these type of corporate actions are rarely going to fun for employees, but if both done quickly and with the buy-in of employees, the odds of success are going to be much higher than might otherwise be the case. Also from this issue were the following (smaller) stories. - "Digital Books Via Cell Phone" details the large number of books available through the App Store for iPhone downloads. Particularly interesting is the low-cost of many classic titles. - The "Innovation" section of the magazine has as one of three different mentions what may well be the next big thing in personal computers. 2008 saw the introduction and popularization of mini "netbook" computers such as the eeePC from Asus or mini-note from HP and this type of device coupled with touchscreen technology will likely soon be coming to a store near you. Not a Circuit City, of course, but, you know... a store. - Lastly, there's an interesting book review on "The King of Madison Avenue: David Ogilvy and the Making of Modern Advertising". Sounds like a fascinating portrait of quite a guy. Not to be lost in the excitement of the Feb 20 swearing-in of Barack Obama as President of the the United States is the day before... Martin Luther King Jr. Day, which very appropriately has had the designation of National Day of Service attached to it. Below is a clip of future first-lady Michelle Obama discussing the idea of Service on Monday and volunteer opportunities can be found at the at the website http://www.usaservice.org/ and either it's event search page or other service opportunities page. For an in-depth look at the idea of National Service, there's was a great 2007 Special Report from Time Magazine on the topic. There's multiple articles as part of the cover story and all can be found under the Time heading "A Time to Serve". Especially compelling, though, is the introductory piece by Time Editor Richard Stengel. Sometimes you come across a piece of writing that is just brilliantly worded and the topic almost secondary. From a pure "good writing" perspective, that's... well, that's incredibly cool... but, also pretty rare. More frequently, you read to find writing that's solidly written, but whose style takes a backseat to it's substance. From the Jan 19 issue of Sports Illustrated, the end of magazine Point After piece on freshman Community College basketball player Kayla Hutchson provides a story of such weight. It's a short (one page in the magazine) telling of how Hutcheson has relied on her teammates to help her cope with the effects of a concussion and subsequent memory loss suffered on the court. Powerful story that's both interesting and has a lot to say about the impact of teammates and friendship. Good stuff. It's been some time since I read it, but I highly recommend "Team of Rivals" by Doris Kearns Goodwin (website here) for anyone interested in politics, Abraham Lincoln, or... on a more timely (and specific)note, President-elect Barack Obama's approach to coalition-building. The subtitle of the book is "The Political Genius of Abraham Lincoln" and after reading it, I can say that the description fits perfectly. Lincoln comes across as a man who may still have had faults, but above all had the strength to both recognize that he needed to both reach out to and bring together behind him people with opposing viewpoints. To this point, Goodwin writes in great detail how Lincoln devoted significant effort to recruiting some of his most bitter rivals... knowing that these people were crucial to his ability to govern and lead. Fascinating stuff and... applying this to the present-day, Barack Obama has both spoken extremely highly of this approach and utilized it in many of his Cabinet choices... which included both former Democratic nominee rivals and Republicans from the Bush Administration. Like many things, it will now be interesting (but, also very important) to see how the Obama administration shakes out and what guiding principles it continues to use. There's no shortage of writing out there about how to improve our health and "live right", but two authors that keep coming up consistently in what I read are Dr. Mehmet Oz and Dr. Andrew Weil. Oz is a frequent contributor to Esquire Magazine and also appears regularly on television shows such as "Oprah" and the "Today Show". A search for his name just on the Esquire website gives 63 different articles he has either written or contributed to, one of which is an "in-depth plan for better health" from the May 2008 issue. Additionally, Oz was included here on Time Magazine's list of the "100 Most Influential People of 2008". Weil is the founder of the Arizona Center for Integrative Medicine at the University of Arizona... which takes a whole body approach to medical care that focuses heavily on prevention through healthy living. He's also written extensively (as his wikipedia page illustrates) and been featured twice on the cover of Time Magazine. Most recently was in the Oct 9, 2005 issue of Time, which featured an in-depth article by Weil titled "Aging Naturally". Not to be confused with a one-trick pony, though, Weil also has 120 other articles that come up in a search for him on the Time website. Weil and Oz taken together provide some really informative writing on a topic that could be considered... pretty important. Really interesting cover story from the Jan 12 issue of BusinessWeek. With it's alternate title for the web of "Whatever Happened to Silicon Valley Innovation?" the story looks at the current environment of technology innovation and how it compares to the past. The simplistic (but, still open for debate) answer is that it's lagging as companies focus less on basic science and "fundamental breakthrough" research and more on incremental innovation. Additionally, the idea of going public as a goal is implicated by the article as a cause for concern. The reason being is that this approach favors a more short-term view of the company and can limit the chance for big game-changing innovations. Related to these concepts, an examination is made of the hottest private Silicon Valley tech companies. Right now some the firms generating the most attention are Facebook, Digg and Twitter... all social networking ventures. Social networking is a huge growth area and shouldn't be discounted, but it's also a fair question to ask whether it's emergence is as profound as actual breakthrough technologies around hardware (either broad categories like computer processing power or specific technology like the iPod or iPhone from Apple). Interesting questions raised by the article... which also links here to a full-chapter excerpt from a book on the topic titled "Closing the Innovation Gap". Written by Judy Estrin... formerly the CTO at Cisco Systems and now an advisor to President-elect Barack Obama, it examines further this notion of short-term focus on the part of US companies... and investors in them. It's not a recent piece, but an article titled "Who's the Voice of this Generation?" from a 2006 Time Magazine bears reading. Written by Andrea Sachs, it looks at the current crop of writers out there and examines why none of them can without question lay claim to being the preeminent young writer of our times. As opposed to past generations where writers like F. Scott Fitzgerald and Ernest Hemingway plied their trade, today it's harder to say who speaks for whom. There are certainly great young writers like Jonathan Franzen (who wrote "The Corrections") and Curtis Sittenfeld (who had written "Prep" at the time of this story and has since published "American Wife", which I reviewed here), but not truly seminal authors. It's an interesting topic that has to do with some very interesting and brilliant authors... none of whom have reached that proverbial "next level"... yet. "The Curious Case of Benjamin Button" came as part of the Christmas Day wave of hopeful blockbusters and even for those with high expectations, it definitely didn't disappoint. The movie stars Brad Pitt and Cate Blanchett, but most intriguing to me prior to release, it was directed by David Fincher. His past directing credits (which can be found on Fincher's http://www.imdb.com/ page here) include "Zodiac", "Seven" and "Fight Club". What I enjoyed most about the film was it's effectiveness at telling an "epic tale of life"... with the twist of it being lived in reverse by Brad Pitt's character... leading to the poignant scenes of relationships between characters aging in different directions. To this whole "epic tale of life" concept... the movie reminded me of both "Titanic" and "Forest Gump". This connection makes sense given the fact that the screenwriter Eric Roth (whose imdb page is here) wrote "Forest Gump" as well. Another thing that helped give the film it's scope is the screenplay by Roth was adapted from an F. Scott Fitzgerald short story of the same name.